Time to amplify our voices. 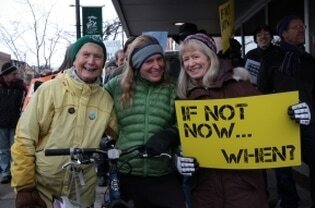 Thanks for joining us for the April 29 for the People's Climate Movement Solidarity March and Rally in Missoula. Head here for media and more. 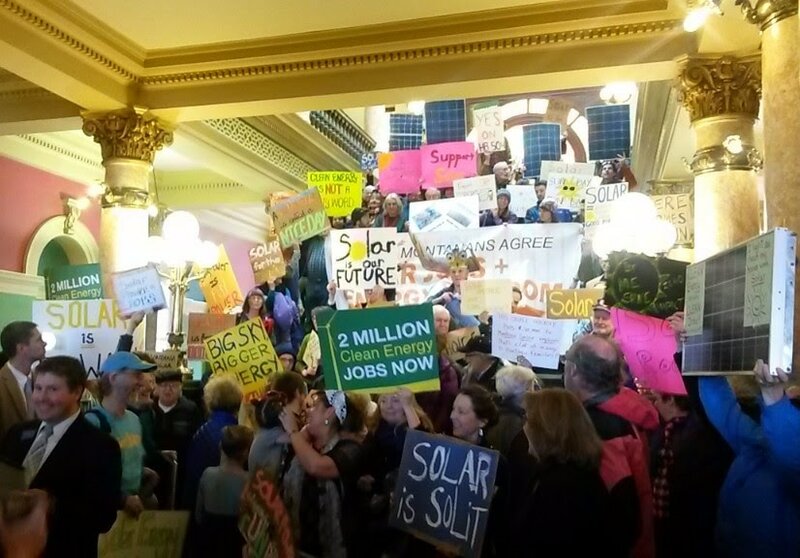 Thanks for attending the SOLAR JOBS RALLY in Helena Feb 23. Frustratingly the awesome solar bill HB504 was tabled in committee. See right for more on this bill. See our calendar for community events - join and bring others. Write a letter to the editor - these are read by elected officials. Share your climate concerns and stories with us - email to get started. ​Create and share Art that speaks to a resilient community. Help us plan a way to save oodles of energy in this town right now. Hug your kids and neighbors, and smile at strangers. ​Because the best tonic for despair is action. Helping Montanans struggling to pay their utility bills by requiring NorthWestern Energy to apply left over net metering credits to low-income bill assistance. Let's not forget what good policy looks like and let's elect leaders who believe in climate solutions and our kids' futures. ​We're working on a recap of the session now that it's done and over! Check back soon. Learn about key issues and bills before the legislature. Find out when bills are being up. We'll keep this updated at least weekly. Find links to your representatives and committee members and to the bills themselves. Contact Governor Bullock. It seems a slew of unhelpful, backward bills are going to pass this session and the Governor is going to need to hear from us that we support vetoes. Net Metering: Many Missoulians have solar arrays "net metered" into the grid, through NorthWestern Energy or a local co-op. Net metering customers receive a credit on their electricity bill for each kilowatt hour of electricity generated on-site and exported to the utility grid. Most net metering systems are wired to provide energy to the customer’s home or business before exporting any excess to utility lines. Most utilities carry forward bill credits from month to month, but never pay the utility customer anything for excess power. In a nutshell, our laws need upgrading to help make them work well for more Montanans. See the Montana Renewable Energy Association's page for more. PACE: Property Assessed Clean Energy. The easiest way to learn what PACE is to read this snazzy 4 pager. If you want to get involved, visit the PACE website and sign up here to show your support. The PACE Act is SB330. This bill has passed the Senate but was TABLED in the House. SO SAD. Contact Alicia with Northern Plains Resource Council for how to stay involved with PACE. SB190. This bill would require the Board of Environmental Review (BER) to adopt rules that further define greenhouse gas emission sources and require the reporting and certification of greenhouse gases to quantify emissions in Montana. This bill requires the BER to report to the Environmental Quality Council and provide the Council with proposals for reducing Montana’s carbon pollution. Montana's DEQ would be required to put together a state plan for dealing with GHG emissions and the effects they have on public health, the environment, and economy. The bill would not create some huge government program. It starts the conversation on how to address emissions that contribute to climate change and how to develop a Montana plan to address it in the absence of federal action. ​This bill passed the Senate Natural Resources Committee and was heard in the full Senate on March 21. It was voted down. DARN. BOO. ​Those are just 3 key issues - there are more, keep scrolling! 2. CHECK THE STATUS OF ANY BILL! There are oodles of solar and renewable energy bills being brought forward this session. Most are bad. No surprise. Here are the latest that we're tracking. Please call your legislators, the entire committee or House or Senate, and consider writing a letter to the editor. We're doing our best to track and pass along what we can. So glad we have partners in Helena! Please speak up to defend and expand clean energy across Montana! SB 32 (Sen. Keith Regier, R-Kalispell) would undermine Montana’s Renewable Energy Standard by repealing the section of that law which requires NorthWestern Energy to purchase a small portion of its electricity from community renewable energy projects such as small-scale wind and solar projects. These projects help to diversify NorthWestern’s portfolio and provide economic benefits to communities across the state. The bill passed was VETOED by the Governor. Thank You. SB 154 (Sen. Mike Lang, R-Malta) would harm solar jobs and investments in Montana by eliminating modest incentives for net metered clean energy systems. Montana’s solar industry is on the cusp of explosive growth that would create new, good paying jobs across the state. Instead of seeking to help these new jobs and businesses grow, this bill bluntly targets only net metering incentives for elimination. This bill has a hearing on 3/20 in the House Energy committee. Please contact members of the committee and ask them to to vote NO on SB 154! SB78 (Sen. Keith Regier, R-Kalispell) attacks solar energy development in Montana by mandating changes to rules set by Montana Public Service Commission (PSC) experts. It would mandate net metering credits be valued at “avoided cost,” a specific valuation method that would prevent the PSC from using its expertise to set rates. It discriminates against net metering customers by adding a new, separate fee ostensibly to cover utility infrastructure costs. These customers already pay this cost. Net metering customers would pay twice for infrastructure. By severely and arbitrarily lowering the crediting rate granted to net metered customers this bill makes investing in and installing distributed renewable energy technologies impractical and will devastate distributed renewable energy businesses in Montana, eliminating an important option for Montanans to invest in their own energy. This bill passed the Senate and had a hearing in the House Energy, Technology, and Federal Relations Committee on April 3 was TABLED. Hooray. SB7 establishes in statute that net metering should not be subsidized by other customers. This bill uses cost shifting, which is inherent in the utility grid system, to discriminate against net metered customers, creating increased costs for net metered customers through which the benefits of their systems would not be fully accounted for. Unfortunately, even in light of heavy opposition during it’s hearing in both the Senate and the House Energy Committees, this bill still made it to the Governor's desk, but was vetoed! Thanks, Gov. Bullock for saying no to this bad bill. SB 235 (Sen. Tom Richmond, R-Billings) would allow the Montana Land Board to extend the date for coal leases beyond their traditional 10-year term if the Board finds that it would be in the “best interest of the state.” The bill could result in a lease renewal for the Otter Creek coal tracts if Arch Coal fails to develop the mine at the end of its current 10-year lease. This also allows the State to forego revenue from a new lease. This bill passed the Senate and has been transmitted to the House, awaiting hearing in committee. This bill will be heard 3-31 in House Natural Resource Committee. Please contact members to request protection of clean water and our climate from coal mine development by opposing SB 235. Making smart vehicles pay? What? Oppose HB 205. The bill would impose a $150 annual fee on electric vehicles and a $90 fee on hybrid electric vehicles. The bill's author used fuzzy math to calculate the amount he thinks electric and hybrid vehicle owners should pay each year to offset the money they don’t pay into the gas tax fund. The bill is a veiled attempt to harm people who use a more environmentally responsible vehicle. No calculation was made of the benefit these vehicle owners provide to us all. The bill has passed the House and had a hearing in the Senate Transportation Committee. Call your state senator and members of the committee and urge them to vote against this bad and backward idea. COmmittee vote failed and let's hope this is dead! SB1 would require all future and current net metered customers use advanced meter and inverter technology. Advanced inverters would allow the utility to remotely disconnect a net metered system in the case of a power outage or line maintenance, and would regulate the output of a net metered system. This bill would unnecessarily add extra costs to rooftop solar, as well as require current customers to make a costly upgrade to their system. It would create a scenario in which a utility could control output of a private generator, without clearly compensating the owner for reduced output or grid services. This bill has been tabled. YES! HB34 would have increased the arbitrary and outdated 50kW cap for net metered system to 250kW for government entities (including schools and universities, city and county governments, as well as federal and tribal governments). This bill was heard very early in the session and marked the beginning of the heavily contested net-metering debate between renewable energy advocates and the utility. Even with resounding support of this bill, it was tabled in committee. HB52 would grandfather net metering customers under any future rate changes. This bill had unanimous support, including from the utilities. This bill was ultimately tabled once House Bill 219 was originally brought forward, due to the overlap. Call the Capitol at 406-444-4800 and request to leave messages for the committee members or individual legislature. Send an email. Easy to do here. Scroll down to find the committee your need. ​Legislature District Map (zoom in and click on your location) – clicking on “website” of each legislator will link directly to their contact information. Contact Governor Bullock and the House Energy Committee and ask them to block bad clean energy bills. There are multiple bad clean energy bills working their way through the legislature that would significantly harm clean energy development in Montana. Right now Governor Bullock needs to hear from everyday people that we are counting on him to stand strong for clean energy. The House Energy Committee has heard or is hearing many of these bills and needs to hear from you as well.